After identifying an insatiable need for ‘authentic and traditional’ Japanese fare, we contemplated tripping out of town to Toronto to fill our bellies with the good stuff. Just as we started to make our preparations, the idea of New York City struck us. Toronto is somewhere we’d always be able to go – it’s less costly relative to the States and doesn’t require crossing an international border. It being Easter weekend, we thought we might as well go for it! Special occasion, check. Family time accounted for, check. Coordinating four peoples’ schedules isn’t always easy and this particular weekend seemed to work well for everyone involved. I have to say that doing the research for where to eat was the most fun part. I contacted a couple NYC bloggers on the Urbanspoon leaderboard and got some really great responses. Shout out to Andrew from Immaculate Infatuation, Jessie from Eat Big Apple and Grace from GraceNotes NYC for their awesome recommendations. With all the international buzz around David Chang and his restaurants based in New York City, Ma Peche and Momofuku Ko were at the top of my list. But as we had only decided to go a few days before actually arriving, getting a table wasn’t the easiest thing to do. 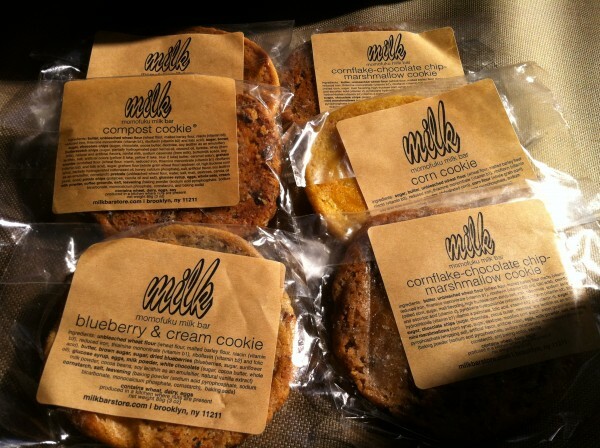 So, I settled for a more casual trip to the Momofuku Milk Bar which was equally exciting. 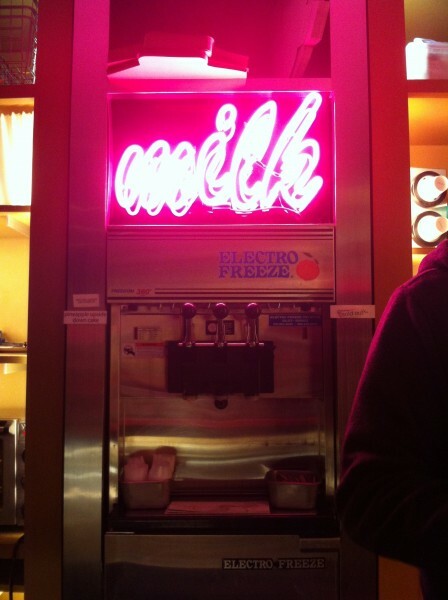 Gazing at the renowned “Milk” sign atop the soft-serve ice cream machine, the neon pink light made the area positively glow. I grabbed a couple pre-packaged cookies off the shelves and got one of each kind: compost, blueberry-cream, corn, peanut butter and the cornflake-chocolate chip-marshmallow with a double of the latter to get the 6 pack deal. At the cash, the birthday truffles underneath the glass caught my eye as I suddenly remembered how beautiful and delicious the cake version looked in the Momofuku Cookbook. So, a small package of three was ordered, all on the go. I ate these with a friend over the course of a couple days, mostly because they were so sweet we couldn’t handle them in just one sitting. I have to say everything I ordered was very, very rich but also very, very delicious. Each bite was probable equivalent to dozens upon dozens of calories. But it was worth it, I think. My favorite cookie has to be the corn cookie, mostly because it was one of the most interesting tasting ones. You could actually taste hints of sweet corn in the biscuit! And weirdly, it tasted really good. When eating the majority of the cookies, butter literally oozed out and coated the inside of your mouth with every bite. Don’t get me wrong – butter is like a nothing else and it makes everything taste heavenly but only if you eat it in moderation. Too much of it and you get this overdose of fat and cholesterol which mostly just makes you feel sick. The birthday truffles were notable, being thick and heavy, these small balls packed a real sweet punch, all the while looking very pretty. I liked the idea behind the sweets Chang had to offer but next time, I’ll have to order a little less. The legendary crack pie and the cereal soft serve are next! 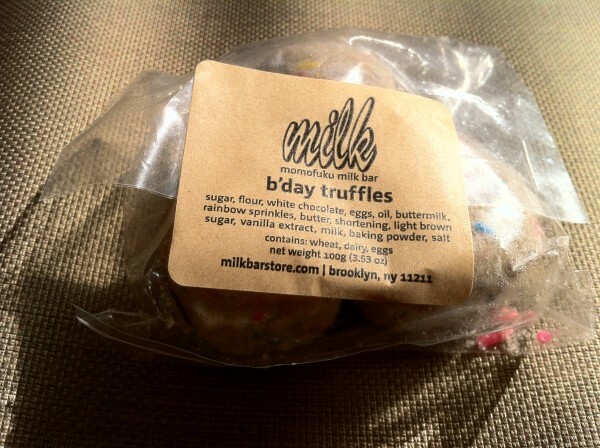 Tags: Birthday Truffles, Blueberries and Cream, Cereal Soft Serve, Chocolate Chip, Compost, Compost Cookie, Cookies, Corn, Corn Cookie, Crack Pie, David Chang, Dessert, forkandtell, Marshmallow, Midtown, Momofuku Cookbook, Momofuku Milk Bar, New York, NYC, Snack, Truffles.